And back with our design teams RibbonStiff layouts and projects, and we think you'll agree there's some inspiration here. 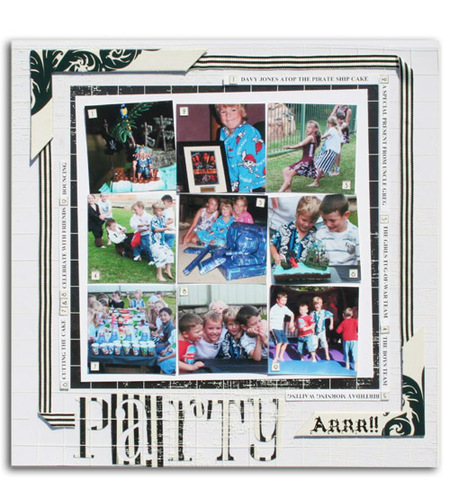 Caz decided to keep her colour scheme neutral for this layout as the fun photos of her son Jesse's pirate party are full of colour. She coated a piece of the wider Strano ribbon with Ribbon Stiff and used the Quickutz Revolution Tool and Blossom Font to cut out the word 'party'. For something a little different she added one of the negative images of the letters to her title. Donna loves a product that offers limitless possibilities and Strano's RibbonStiff does exactly that! 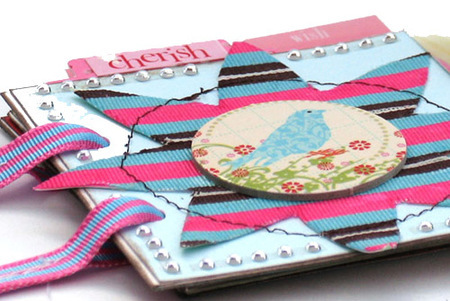 The idea behind the creation of this layout was to create a layered ribbon to coordinate with Donna's choice of patterned paper. Although there are many, many colour combinations of ribbons to choose from, sometimes the right colours elude us. By layering several ribbons - using RibbonStiff to meld the ribbons together - Donna has created the precise 'look' and colour combination she desired. Donna's favourite part of this layout however, is the scallop-edged ribbon. It is a small detail, but one that adds so much to the overall layout. By coating the wide 7/8" Strano ribbon with RibbonStiff and allowing to dry, she was able to use her BasicGrey Notch and Die Cutting tool to create a funky scalloped edge. And let's not forget the simple fact that a little RibbonStiff applied to the ends of ribbons means that frayed edges are now a thing of the past and we can all use ribbon confidently without fear of 'retribution'! For the front cover of this album, Mel cut out a large flower shape using plain paper. 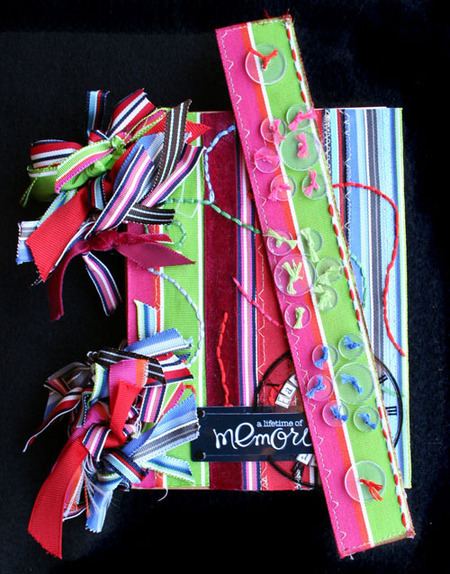 She then placed strips of Strano ribbon over the shape, applied RibbonStiff to the ribbon and then once dry, cut out the flower shape - which left a perfect non-fraying ribbon embellishment for the front of her mini album. 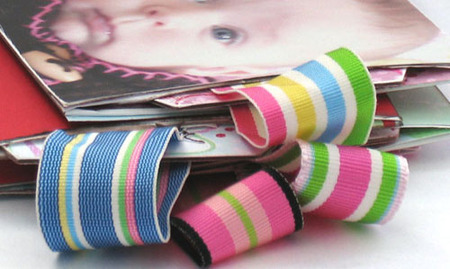 Ribbon stiff was also used to prevent fraying on the ribbon tabs on the album. 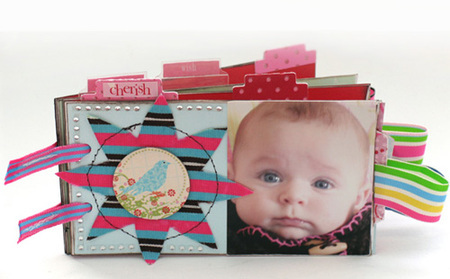 The gorgeous little album used here is a Carolees Creations Adorn-it coupon book. Jaimie wanted to create something a little different for her holiday journal cover. She used Ribbonstiff on these bright Strano ribbons, when dry she machine sewed them together and handstiched flourishes in co ordinating embroidery thread. 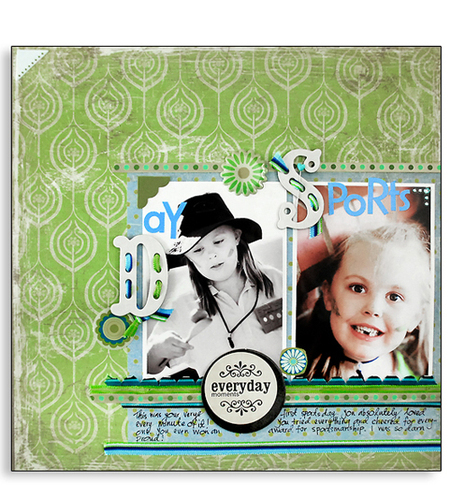 Heidi Swapp Family credit card slides, clear clock face and brads were a perfect combination with Carolees Creations letter stickers for her title. 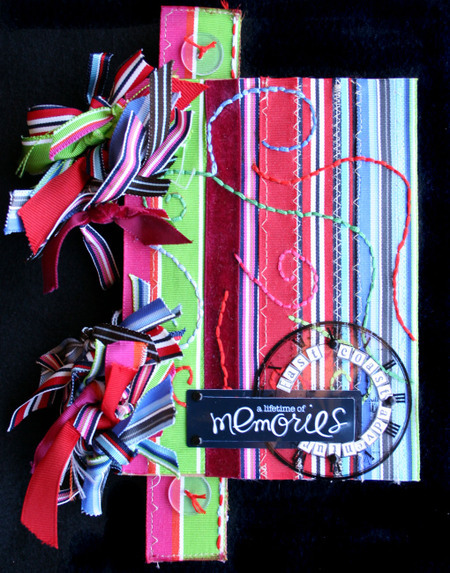 Jaimie attached her cover to the journal and tied three lots of ribbon to each spiral to give it a 'full' look. She also created a funky bookmark with handsewn Hero Arts buttons and handstitching for her daughter, so she wont lose her place in her book.